Okay, okay. I'm not saying that so you'll be all like, "Angelaaaaa... noooooo... you're a wonderful blogger." So, let's get that out of the way right there. Okey-dokey? I've just made some observations during my over-four-years of blogging. (Evidently, my blogiversary was November 28th. I actually didn't know that until just now. I had to go back to my myspace archives and look it up. Just another piece of supportive evidence for the title of this post. Every good blogger knows their blogiversary. I didn't.) And I've come to the conclusion that I am NOT a very good blogger. I think I write well. I think I write me... meaning, I'm myself... which usually means I overuse and wrongly use punctuation... as in right now... because it brings out the emphasis in what I'm trying to say so WELL!!! And that would put me in the good blogger category. *I take horrible pictures. Yeah, you know it. You've seen them. They're awful. I'm an awful photographer. Every blogger seems to be amazing at this. I am obviously not. I've tried. It just doesn't happen. *I'm not consistent. You may get a blog every day. You may not get a blog for over a week and a half. Sometimes I apologize for my randomness. But, an apology does not bring about changed behavior. And, this is just how it is. Because life gets crazy. *I don't use cool pseudonyms for my family. My husband is Nate. Or "hubby." Or "handsome hubby." But, you know his name. And you also know the names of my children. See? That's not a cool-blogger kind of thing. *I don't really have an overarching theme. Well, yes, I do. It's stilettos and grace... it's the (un)balancing act of being a woman... but it's not home decor or politics or fashion or cooking or *definitely not* photography or celebrities or... or... Most great bloggers have a pretty specific theme they stick to. (Okay, I do hit fashion a lot. But that's because I want you girlies to know that you CAN be cute AND womanly AND motherly AND Godly AND budget-friendly all at the same time. *I am very passionate about what I'm posting and at times use strong speech. Every good blogger knows you should stay away from possibly sensitive or offensive subjects. Me? I'm not going to be quiet about grave wrongs in our world. Especially not on this. Or on this. *I don't do giveaways often enough. In fact, I've only ever done one. I've meant to do more. But meaning to do something and actually doing it are two entirely different things. Whoops. *I don't do the Mr. Linky thing. Which I want to do, I just never get around to it. It would be cool, because you could put your links on my blog. I just... well... haven't done it. *I don't leave a bunch of comments around the blogosphere. Which you're supposed to do to increase traffic. But, I don't. It just takes a lot of time. So, I only leave comments on the ones I want to leave comments on, not because I want to "promote" my blog via someone else's comments page. *I'm not consistent with my "days." Meaning Sassy Shoe Thursday. Which switched to Sassy Fashion Thursday. Then Sassy Fashion Friday. Then Fashion Tip Friday. And now we've reverted and have both Sassy Shoe Thursday AND Fashion Tip Friday... neither of which I do on a weekly basis. Which is the point of having distinctly designated "days." *I'm turning off the comment option. *gasp* I know. So many great and amazing bloggers get oodles and oodles of comments. They carry on conversations in the comments. They attract more readers to their blog because of the comments. I mean, that's one of the reasons we blog, right? To get comments. This is an experiment I've been thinking of doing for a while. Because I don't want people to feel obligated. And I have so many readers that don't leave comments anyway. And, I don't do this for the comments. I love them, don't get me wrong. I always love hearing your thoughts. Always, always, always. Even if they disagree with mine. But, it's just not about that, you know? So, at least for the time being, I'm disabling comments. Which officially makes me a bad blogger. Those who follow me from my facebook links, you can still comment on there if you'd like. But, you won't be able to here. And, if you want to email me, by all means! 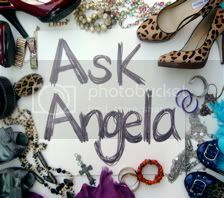 Just click that cute little Ask Angela button over there at the top of the sidebar. I would love to hear from you... thoughts... concerns... questions... input. Reading back over the evidence, I really am not your typical, with-it blogger. Like, even more so than I had originally suspected. And, for some completely unsubstantiated reason, I'd like to think my blogging is making just an inkling of a difference in my little corner of bloggyland... and consequently the world. So, I'm gonna keep on keepin' on. I truly do love each of my readers. I encourage you to go change a corner of your world. Maybe even while wearing stilettos.